NEW WORK FROM APRIL 2012. Colour Sequence Application to Continuous Line Drawings by Mick Burton – demonstration continued. Clyde the Elephant, single continuous line with colour sequence by Mick Burton. This is the continuation post covering my demonstration and workshop at Harrogate and Nidderdale Art Club on 6 December 2018. Here is a reminder of my marker pen attempt at a continuous line elephant. Demonstration of a Single Continuous Line Elephant, initial drawing, at Harrogate and Nidderdale Art Club by Mick Burton, on 6 December 2018. At home later I followed the line/s around and found that there was more than one line and I needed to do one or two diversions to correct that. As the pattern at the front of the neck has a sort of square which I needed to get rid of I used that region to also turn the drawing into a single line throughout. With a bit of general smoothing of arcs all round I arrived at the following revised elephant. Revised single continuous line elephant. Mick Burton, Leeds Artist. The next stage was to apply my Colour Sequence to the lines, which I completed in the last few days. The result is shown at the top of this post. To explain the process I use, and how it works, I will briefly go through the illustrations which I used later on in the Demonstration at Harrogate and Nidderdale Art Club. We start by drawing a winding line in an anticlockwise direction. Stage 1. Single line drawn anticlockwise. Mick Burton explains colour sequence. Then, starting on an outside section of line, overdraw in red alternate sections of line. This results in three different continuous line sections bounded by a red line. Stage 2. Overdraw in red missing alternate sections. Mick Burton explains colour sequence. We can now number all the areas to indicate where the colours in the sequence go. Call the outside 0 and number through the sections to 5 in the middle. You will see that each channel between red lines has alternately numbered areas. Stage 3. Number the areas in sequence from the outside (being 0) to the middle (being 5). Mick Burton explains colour sequence. I have already decided on a sequence of colours to use, running from light tones to darker and from yellow to red. First apply yellow and gold alternately throughout the outer corridor. Stage 4. Paint alternate colours within the outer corridor. Mick Burton explains Colour Sequence. Paint in the next two colours from the sequence – orange (which looks reddish here) and red – alternately in the inner corridor. You can see how the colours are lining up in natural sequence of tone and colour. Stage 5. Paint second set of alternate colours (orange, which looks reddish here, and red) in the next corridor. Mick Burton explains colour sequence. Lastly, for our anticlockwise line we paint the central area (which has its own red line surrounding it). The result is a simple set of sequences running from the outside to the middle. Stage 6. The last colour in the sequence (dark red) is added in the centre. Mick Burton explains colour sequence. As you will have realised, each loop going over earlier parts of the drawing adds a level, like overlapping shadows or leaves on a tree looking darker as they overlap. The direction of darker tones of colour in the sequence reflects this. In more complex drawings, however, the sequences of colours can change direction. To show this we need to have a different single continuous line. Start drawing your line with two loops from the lower left in an anticlockwise direction as before. When you reach the upper left change to doing three loops in a clockwise direction and then go back to the start by a line running underneath. Stage 7. Start drawing your line from the lower left in an anticlockwise direction doing loops and when you reach the higher left change to clockwise loops running back to the right. Then finish clockwise running underneath to the start. Mick Burton explains colour sequence. Here is confirmation of the directions of the line, anticlockwise and clockwise, and how they change and run back over earlier lines. We now have a more complex drawing for colouring. Stage 8. Here is the completed single line with the directions shown – red for anticlockwise and blue for clockwise. Mick Burton explains colour sequence. By applying alternate overdraw in red we split the drawing into corridors which look a bit more complicated than the simple anticlockwise drawing we did earlier. Stage 9. Alternate overdraw in red splits the new drawing up into corridors for colouring. Mick Burton explains colour sequence. When we number the areas, starting at 0 on the outside as before, we have plus numbers at the top of the drawing but minus numbers appear in the lower corridor. When we follow the natural sequence of numbers downwards from 2 through 1 and 0 we hit -1 and -2. Stage 10. Numbering from 0 on the outside as before we get minus numbers as well as plus. Mick Burton explains colour sequence. After I had been doing my colour sequence for a few years I found out that mathematicians call this mix of anti and clock directions Winding Number Theory. When you continue with loops in an anticlockwise direction you are adding levels of overlap and when you change to clockwise you start reducing levels. We can now apply alternate colours yellow and red to the upper channel. Stage 11. First set of alternate colours in the upper channel on the complex drawing. Mick Burton explains colour sequence. Then we can complete the positive colour direction. Stage 12. Completing the plus direction colours by adding dark red. Mick Burton, continuous line artist. Now looking at the lower colours, in the clockwise section of the drawing we add the final two colours alternately. Stage 13. Complete colour sequence on single continuous line drawn in both anticlockwise and clockwise directions. Mick Burton, Leeds artist. So that is the basis of how I do my colour sequence. For my elephant, it is more complicated and I show below my sketch after doing the alternate overdraws to create the corridors of alternate colours and then numbered the colours throughout. Single continuous line elephant showing alternate overdrawn lines in red and colour numbering. The key to the colour sequence and numbering is shown. Mick Burton, continuous line artist. I have shown the key to the colour sequence and numbering in the top right corner. The colours can be employed in the opposite direction, of course, but with all my drawings the choice of which direction of sequence to adopt is not too difficult. The darker colours fall lower down or on the main body of the animal and the more delicate red, orange and yellow mostly on the face. I only use red once, and that is on the eye. This really reflects the greater detail on a face which extends the colour range. Several of my colour sequence animals have the eye coloured by an end of range colour only used once in the drawing, eg. Iguana, Harriet the Hen and Olympic Lion. The completed elephant, at the top of the post, has a story behind it. I did the initial drawing in my demonstration to Harrogate and Nidderdale Art Club on 6 December 2018, which is the day my first grandson, Lucas, was born in Glasgow, son of Kate and Mark. I have decided to call the elephant Clyde after the famous Glasgow river. Lucas can have a picture on his wall which is exactly as old as he is. 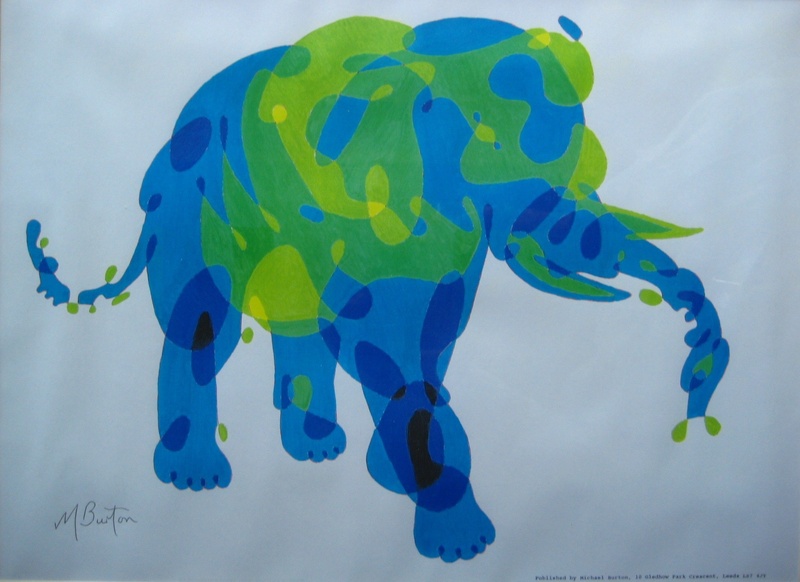 This entry was posted in Animals, Demonstrations and Workshops, Uncategorized and tagged Alternate Overdraw, born in Glasgow, channel of alternate colours, Clyde the elephant, colour sequence, continuous line artist, Continuous line drawing, continuous line sections, corridor of alternate colours, elephant, elephant continuous line, Harriet the Hen, Harrogate and Nidderdale Art Club, Iguana, Mick Burton, Mick Burton Blog, Mick Burton continuous line artist, Mick Burton demonstration, mick burton leeds artist, Mick Burton Yorkshire artist, natural sequence of colours, natural sequence of numbers, natural sequence of tones, olympic lion, overlapping shadows, scale of colours, sequence of tones, single continuous line, Single continuous line elephant, single line drawn anticlockwise, winding number anticlockwise, winding number clockwise, Winding Number theory on January 12, 2019 by mickburton2. Mick Burton explains how alternate shading can be used to colour a completed single continuous line. This is Dottie, a lurcher pointer cross. Harrogate and Nidderdale Art Club, December 2018. Photo by Chris Noble. As a member of Harrogate and Nidderdale Art Club I was delighted to run a workshop in December 2018 to demonstrate how I do my Single Continuous Lines and here I explain (above) how black and white alternate shading was applied to Dottie at the request of her owners. Here is a photo of Dottie (below) checking out her portrait. This is Dottie checking out her portrait, done in Single Continuous Line with alternate shading by Mick Burton. Photo by Stuart Firth. I explained what my approach was to drawing Single Continuous Lines. People often assume that I start at one point and draw the line, depicting my subject, all in one go and finish where I started. I have done this from time to time, and my cat drawing is an example, but I now complete all my drawings in sections and then gradually connect up all the loose ends. One of the more enjoyable parts of doing continuous lines is the freedom to incorporate all sorts of patterns involving curves, loops, sharp corners, etc. In my case doodling these patterns was first triggered when I saw examples of Art Nouveau when I was about 9 years old. I now drew some examples for the members and asked them to have a practice. I then explained my approach to drawing an animal. After doing a very basic sketch of my subject, I put in key marks throughout and then start on one section, such as the head. Next I will initiate other parts such as legs and other distinctive features before connecting up all the lines. I do not worry at this stage if there is more than one continuous line throughout, or that the lines may appear to be crudely drawn. I said that I would demonstrate this approach by drawing an elephant, a subject which I have not attempted for about 50 years. The result is shown below. At home I usually start by using pencil on A4 size paper so that I can change the line as I go on. The result can be scanned into my computer so that I can scale up to any size using Excel. For Dottie, above, scaling up resulted in printing off 10 A4 sheets to stick together so that I could then trace through onto a big canvas. For demonstrations I use a thick marker pen, usually on to A2 size paper but as there is a large screen at this club I used A3 size paper. Poor quality paper is alright as the marker moves more smoothly, but of course a slightly shaking hand is magnified on the big screen. It is important to keep an eye on loose ends. I realised that I had three at one stage and was struggling to see the fourth, but a member spotted it on the big screen. It was not too far away and I could link it back in without making the lines look too congested. Demonstration of a Single Continuous Line Elephant, initial drawing, at Harrogate and Nidderdale Art Club by Mick Burton, December 2018. I said that this was fine as an example and the members could now have a go at any subject they wanted. Also not to worry too much about loose ends or not being able to keep the lines clean. Part of my aim was to introduce elements that could be incorporated into their own work and to encourage people to develop patterns or techniques of their own. Regarding my elephant, I said that I would smarten it up later at home, by making sure that there was only one continuous line, smooth out the curves, etc and show them the result at a later meeting. Also, I would produce a coloured version at home to link in with my intention to explain my colours later in the current session. I was pleased with the drawings the members produced and enjoyed going round discussing their progress. Here are a few examples of their lines, continuous or otherwise, including some colouring (which I did not start to cover until after these drawings). Kingfisher continuous line by member of Harrogate and Nidderdale Art Club, December 2018. Photo Mick Burton. Dolphin continuous line by member of Harrogate and Nidderdale Art Club, December 2018. Photo Mick Burton. Runners continuous lines by member of Harrogate and Nidderdale Art Club. Photo Mick Burton. 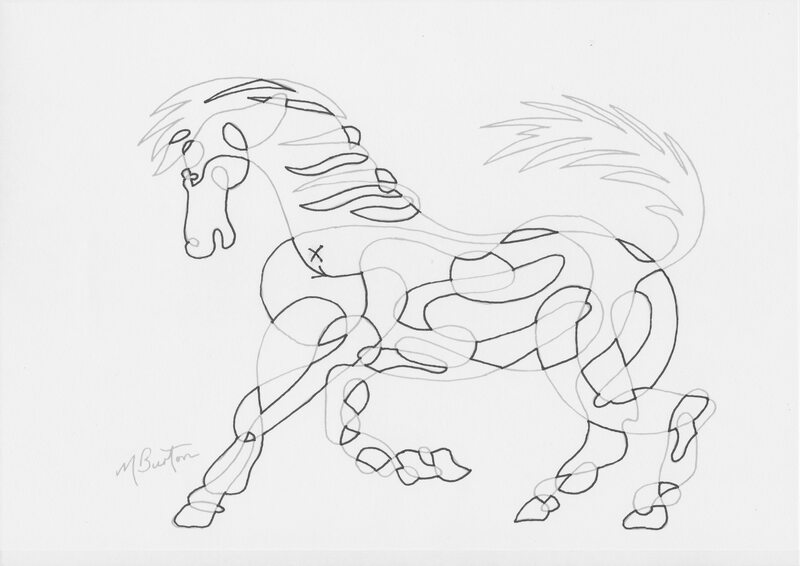 Horse continuous line by member of Harrogate and Nidderdale Art Club. Photo Mick Burton. Dog continuous line by a member of Harrogate and Nidderdale Art Club. Photo Mick Burton. Pigs continuous lines by a member of Harrogate and Nidderdale Art Club. Photo Mick Burton. Teddy continuous line, done on a laptop, by a member of Harrogate and Nidderdale Art Club. Photo Mick Burton. Hen continuous line by a member of Harrogate and Nidderdale Art Club. Photo Mick Burton. Lady continuous line by a member of Harrogate and Nidderdale Art club. Photo Mick Burton. Cat continuous line, with colour, by member of Harrogate and Nidderdale Art Club. Photo Mick Burton. Abstract continuous line, with some colour, by member of Harrogate and Nidderdale Art Club. Photo Mick Burton. Abstract continuous line, with overs and unders, by a member of Harrogate and Nidderdale Art Club. Photo Mick Burton. Abstract continuous line, with red alternate shading, by member of Harrogate and Nidderdale Art Club. Photo Mick Burton. Whilst members were continuing with their continuous line drawings I talked about the backgrounds that I had gradually introduced into my pictures to add to the overall composition including my continuous lines. Rather than simply have a plain background I have added to many paintings a simple coloured pattern effect which I feel complements the individual composition. One example is a layered graduation of colours for my Single Continuous Line of a pig with my colour sequence. I call the picture “Pig with Rasher Sky”. Mick Burton explaining his layered background to his painting “Pig with Rasher Sky” at his demonstration and workshop at Harrogate and Nidderdale Art Club. Photo by Chris Noble. 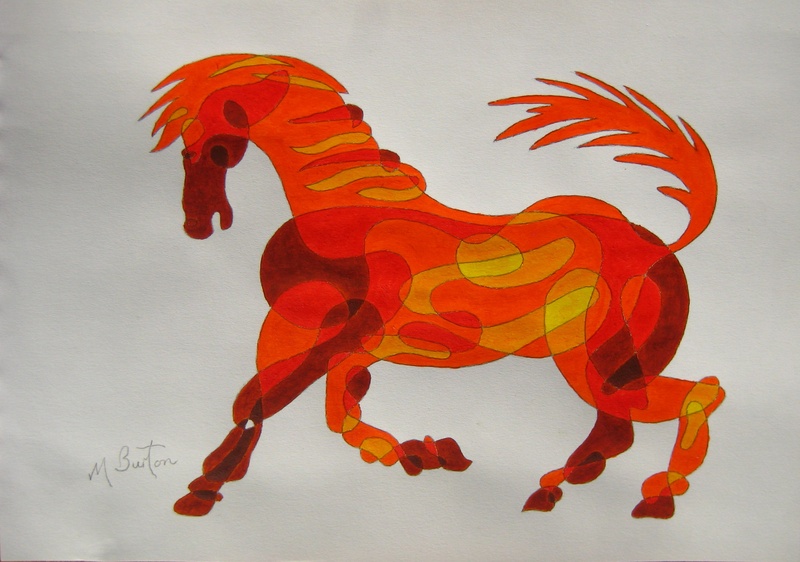 Another background is in my “Stained Glass Window Horse” which appears below. Having spent considerable time in Ripon Cathedral when young I was always impressed by stained glass windows. I also read a lot of Dandy comics where Desperate Dan sometimes jumped through a brick wall, “into the middle of next week”. Consequently the horse has a gap in the wall similar to its outline and I have not included any cement and so that the sun shines through the gaps in the stones as well as the glass. I chose a canvas where the sun can shine through as well. Mick Burton explains the stone wall effect as background to his painting “Stained Glass Horse” during workshop at Harrogate and Nidderdale Art Club, December 2018. Photo Chris Noble. Later in the session I explained how my colours are devised and applied and I will cover this in a further post soon, which will also include the finished version of my new elephant and how my colour sequence naturally applies to it (hopefully). This entry was posted in Animals, Demonstrations and Workshops and tagged abstract continuous line, Alternate shading, Art Nouveau, Background to continuous line, black and white, Butterfly continuous line, cat continuous line, Chris Noble, colour sequence, Dandy, Desparate Dan, Dog continuous line, Dolphin continuous line, Doodling, Dottie portrait, elephant, elephant continuous line, Harrogate and Nidderdale Art Club, Hen continuous line, Horse continuous line, Kingfisher continuous line, Lady continuous line, Layered graduation of colours, line loose ends, Mick Burton continuous line artist, Mick Burton demonstration, mick burton leeds artist, Mick Burton Yorkshire artist, Pig continuous line, Pig with Rasher Sky, Rhino continuous line, Ripon Cathedral, Runner continuous line, Scale up on Excel, single continuous line, Single continuous line drawing, Single continuous line elephant, Stained Glass Window Horse, Stuart Firth, Teddy continuous line, trace onto canvas, Workshop by Mick Burton on December 28, 2018 by mickburton2. Continuous Line Artist view of Haken’s Gordian Knot. Depth of lines in black and white, in Haken’s Gordian Knot. Mick Burton, single continuous line drawing 2015. Here is an update on posts which I did in May and June 2015 regarding the above Knot and the interest these posts have since generated. As a Continuous Line Artist I have looked at many angles of what my lines may mean and what they can do. One such examination was triggered by Haken’s Gordian Knot, a complicated looking knot which is really an unknot in disguise – a simple circle of string (ends glued together) making a closed line, which I saw in a book called “Professor Stewart’s Cabinet of Mathematical Curiosities”. The drawing above is my version of Ian Agol’s illustration of the Haken Knot (see it in my post of 31 May 2015). I used dark and light shades to emphasize the Overs and Unders shown for the line. The reason that I was so interested was that it reminded me of my “Twisting, Overlapping, Envelope Elephant” (see below). This single continuous line drawing is coloured to represent a “Twisting, Overlapping, Envelope Elephant”, which is Blue on one side and Red on the other. Mick Burton, 2013. How this elephant line works is explained in my post of 31 May 2015. In essence, you need to imagine that the composition is made up of a flexible plastic sheet which is Blue on the front and Red on the back. Each time there is a twist, on an outer edge in the drawing, you see the other colour. In the Gordian Knot, I spotted that there is a narrow loop starting on the outside (lower left on first illustration above) which seemed to lead into the structure, with its two strands twisting as it went, each time in a clockwise direction. I followed the two twisting lines throughout the drawing until they ended in a final loop on the outside (left higher). I counted 36 clockwise twists and one anticlockwise. My thoughts are explained in full in my post of 2 June 2015. To aid the explanation I completed a painted version, where I used the same Blue and Red colours, as for the above elephant, to emphasize the twists. Twisting, overlapping colouring of Haken’s Gordian Knot. Mick Burton, single continuous line drawing painting 2015. 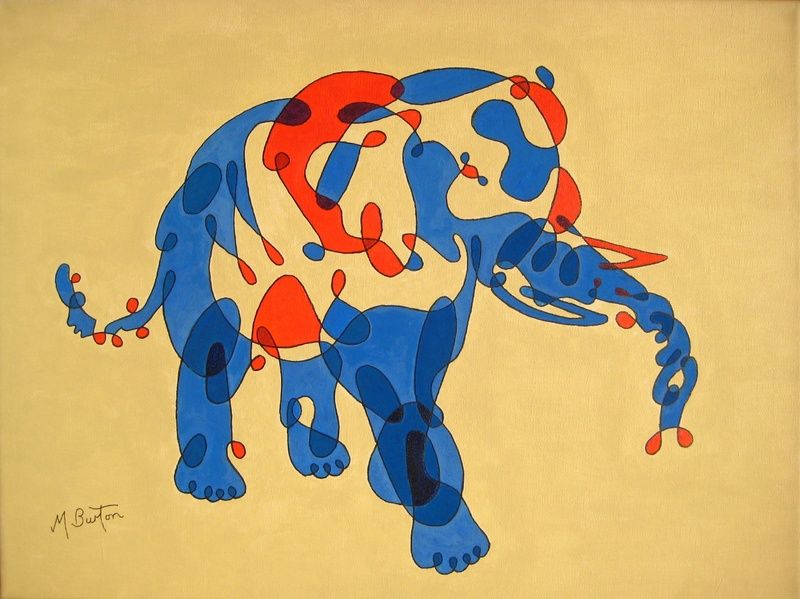 Note that the colours in the Elephant define two sides of a surface, but in the Unknot the colours are illustrating the twist of two lines travelling together. The twin lines go through other loops continually so there are no real surfaces. After completing the above two posts, I decided that I would try and find out more about the Knot and came across a question posed by mathematician Timothy Gowers, in January 2011, on the MathOverflow website. He had asked for examples of very hard unknots and after many answers he had arrived at Haken’s “Gordian Knot”. He described the difficulties he was having. Timothy said that he would love to put a picture of the process on the website and asked for suggestions. As I had already done two pictures before I read his post I decided to respond. The work that I did on this is detailed in my post of 5 June 2015 entitled “How do you construct Haken’s Gordian Knot?”. My response duly appeared on the MathOverflow website in early 2015, but within a day or two it had been taken down and a notice appeared stating that only mathematicians of a certain status should post on the site. That’s fine as my only maths qualification is General Certificate of Education at school. At Harrogate Technical College I was thrown out of Shorthand and, with only three months to go to GCE exams they put me in for Maths and Art. I owe many thanks to the Shorthand teacher, who thought my only skill was picking locks when someone forgot their locker key. Also I have never had any discussion face to face with a mathematician about my art or my maths. Following this setback I decided to set it all down in my Blog, in the three posts up to 5 June 2015. Although I have not actually talked directly to a mathematician, I did correspond with Robin Wilson and Fred Holroyd at the Open University in the mid 1970’s about my ideas on the Four Colour Map Theorem. I set out my ideas briefly in my post of 18 August 2015 “Four Colour Theorem continuous line overdraw”. When Fred Holroyd responded to my write up, he used my own expressions and definitions which was very impressive. He said that I had proved a connected problem, only proved in the world as recently as 16 years previously. When I asked Robin Wilson about the announcement from a mathematician who said that he had proved the Four Colour Theorem, Robin said not to worry as he thought that this one was unlikely to be validated. He said that he would prefer that my theory could be proved as it was elegant and also that they could use it. The theorem was proven in 1976 by Kenneth Appel and Wolfgang Haken, involving running one of the biggest computers for over 1000 hours. After this I decided to go onto other things, leaving my art and maths behind for almost 40 years. Yes, its the very same Wolfgang Haken, who devised the Gordian Knot! Ok, lets move on. In February 2016 I received an e-mail from Noboru Ito, a mathematician in Japan, saying that he had read my article of 5 June 2015 “How do you construct Haken’s Gordian Knot?” and it was very helpful. He would like to add it to the reference of his new book “Knot Projections”. Of course I agreed and he later confirmed that he had referenced my work to the preface of his book. Here is a picture of my copy of his book which was published in December 2016. “Knot Projections” by Noboru Ito, published December 2016 by CRC Press, a Chapman & Hall Book. Additionally, in November 2017 I received an e-mail from Tomasz Mrowka, a mathematician at the Massachusetts Institute of Technology. He said that he was interested in acquiring a copy of my Twisting, Overlapping colouring of Haken’s unknot. “It’s really quite striking and I would love to hang it in my office”. I was delighted to send him a photo which he could enlarge and frame. This entry was posted in Abstract, Animals, Famous Artists, Mathematics & My Art, My Styles of Drawing and Colouring and tagged Abstract, abstract continuous line, Appel and Haken, art, biggest computers, black and white, blue and red, Chapman & Hall book, clockwise, clockwise twists, closed line, colour selection, Continuous Line, Continuous line animal, continuous line artist, continuous line artist blog, Continuous line drawing, continuous line overdraw, counter-clockwise, CRC Press, elephant, elephant continuous line, end loop, feed through points, flexible plastic sheet, Four Colour Map Theorem, Fred Holroyd Open University, Gordian Knot, Haken, Haken Knot, Haken's Gordian Knot, Harrogate Secondary Technical School, Ian Agol, Kenneth Appel and Wolfgang Haken, KInot Projections, knot, Massachusets Institute of Technology, mathematical, mathematical curiosities, mathematician, MathOverflow website, Maths, Mick Burton, Mick Burton Blog, Mick Burton continuous line blog, mick burton leeds artist, Mick Burton Yorkshire artist, narrow loop, No real surfaces, Noboru Ito, Overs and Unders, Professor Stewart's, proof of four colour theorem, Robin Wilson Open University, sheet of plastic, single continuous line, starting loop, Timothy Gowers, Tomasz Mrowka, Twisting overlapping colour, twisting overlapping envelope, twisting pair of lines, twisting strands, two strands twisting, Unknot on May 9, 2018 by mickburton2. Twisting, Overlapping, Envelope Elephant. Continuous Line Drawing colouring. 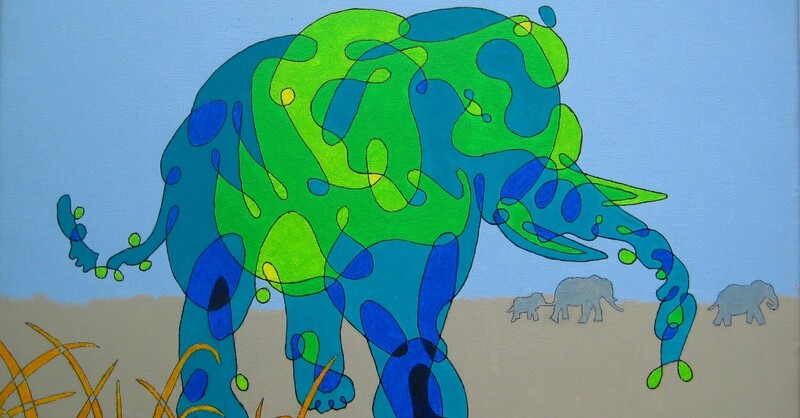 “Fluorescephant”, the original version of “Elephant Grass” which is at the top of this continuous line blog, was my first successful Colour Sequence painting. The sequence ran from yellow through greens to blues in steps of colour and tones which gave a natural three dimensional effect and dynamism. Part of this was the overlapping nature of continuous lines which was reflected by the successive darker colouring. The painting was accepted for the International Amateur Artist exhibition, in Warwick Square London, in February 1973 and then a month later in the National Society annual open exhibition in the Mall Galleries. Fluorescephant. Continuous line drawing with colour sequence. National Society Open Exhibition, Mall Gallery, London, 1973. Mick Burton. I was never totally happy with the colouring. I thought that there was an extra natural effect, on top of the overlapping, which I was missing. When I started my art again in 2012, after a gap of nearly 40 years, I once more tried to sort this out. I realised that I could enhance the twisting of the design and highlight gaps where the outside would show through. Here is the result, “Twisting, Overlapping, Envelope Elephant”. Imagine that the continuous lines are describing a sheet of plastic, which is coloured Blue on the front and Red on the back. Each time a twist occurs, against the outside background, then I colour it Red. When the overlaps build up, the shades of the blue front go darker blue, and the shades of the twisted areas become darker red. Where the blue front and the red back occasionally overlap, then I use violet to reflect the mix. This continuous line drawing is coloured to represent a “Twisting, Overlapping, Envelope Elephant”, which is Blue on one side and Red on the other. Mick Burton, 2013. You can see considerable areas of background colour within the animal showing through. This looks natural within the form of the elephant. The blue areas, including darker blue overlaps, are the same as the blue areas in the “Fluorescephant”, so it is good to keep a large part of the original colour sequence in this change of style. This entry was posted in Animals, My Styles of Drawing and Colouring and tagged Africa, animals, background showing through, colour sequence, Continuous Line, continuous line blog, elephant continuous line, International Amateur Artist Exhibition, Mall Gallaries, mick burton leeds artist, Mick Burton Yorkshire artist, National Society, natural three dimensional, overlapping areas, sheet of plastic, twisting overlapping envelope on May 31, 2015 by mickburton2. Fig 1. 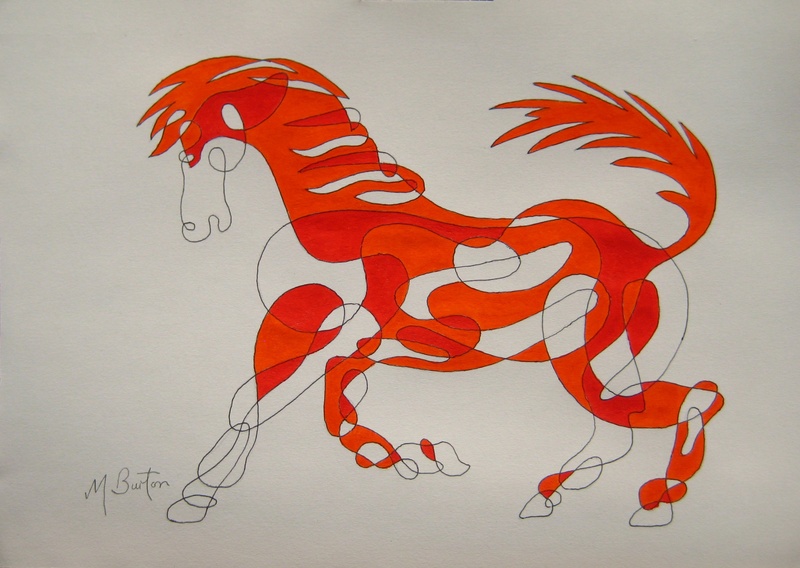 Completed Colour Sequence on Single Continuous Line Drawing of horse. Mick Burton, Continuous Line Blog. How do I apply Colour Sequence to my Continuous Line Drawings, which I first developed in the late 1960,s ? In my last blog post, about Alternate Overdraw of My Continuous Lines, I pointed out that Colour Sequence was the next stage and so here we go. I will now show the stages involved in completing the colouring of this Horse. Fig 2. 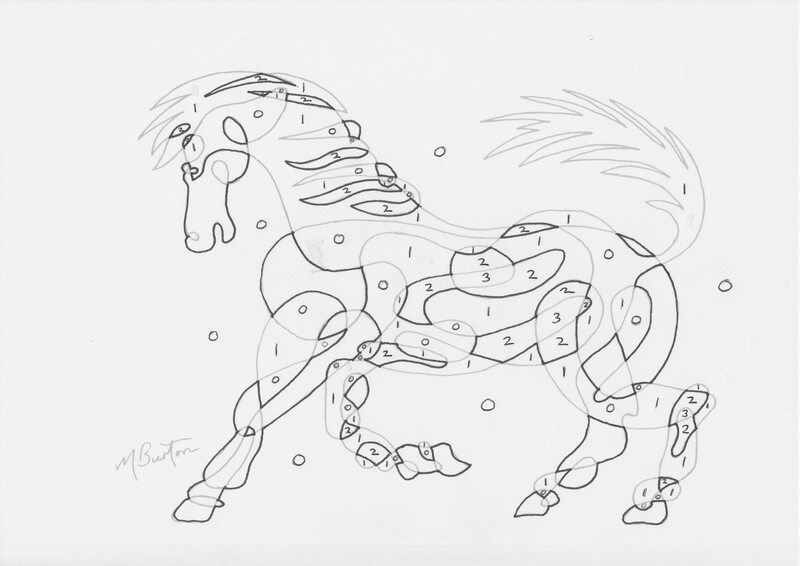 Alternate Overdraw on Single Continuous Line Drawing of the Horse, as the first stage of Colour Sequence. Mick Burton, Continuous Line Blog. From the two Alternate Overdraw examples in the previous post, I have chosen Fig 2 commencing at point “X” for this example (either “A” or “X” would result in the same colour sequence). We are going to number all areas of the drawing, commencing with the background which will be numbered “0”. In this example the background will remain uncoloured but “0” will also occur within the drawing and have a colour. Fig 3. Initial numbering (0 and 1) of channels between Alternate Overdraws on the Continuous Line Horse. You will notice that between all the closed lines, formed by the Alternate Overdraws, there are channels of areas. These can be completely numbered alternately by only two numbers, which in this case are 0 and 1. So, starting with 0 on the background, work through all these linked channels, see Fig 3. This also sets the direction of the number sequence throughout the drawing. Fig 4. Colour Sequence numbers 2 and 3 on the Continuous Line Horse. The numbering progresses both upwards through positive numbers and downwards through negative numbers. We will start with the positive direction and allocate the next pair of numbers, 2 and 3. By moving from an 0 area into a 1 area, and on through its Alternate Overdraw border, we will enter an un-allocated area we can mark 2. Now deal with all the other areas in this new channel, marking alternate areas 3 and 2, to complete this allocation. After this we need to check for any further Alternate Overdraw channel, or channels, at this level adjacent to 1 areas and then allocate 2 and 3 to them also, see Fig 4. We then need to check for any further Alternate Overdraw channels enclosed within any of the 2 and 3 channels. If we found one we would allocate 4 and 5 to the new channel or channels. In this case there is no higher level channel. Fig 5. 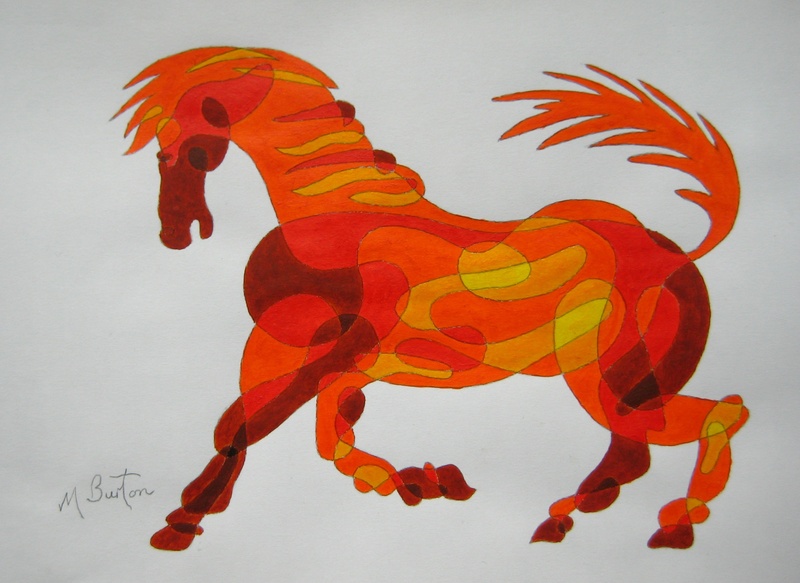 Colour Sequence numbers (-)1 and (-)2 on the Single Continuous Line Horse. Mick Burton, Continuous Line Blog. Having completed the numbering of areas in the positive direction, we now go into the negative in Fig 5. By looking at an area 1 and moving through a 0 area with an Alternate Overdraw border we can cross through that into a (-)1 and (-)2 channel. Mark the initial one (-)1 and then allocate alternately through the channel with (-)2 and (-)1. After completing that channel, look for other un-allocated channels adjacent to 0 areas and allocate (-)1 and (-)2 to them. Now look for further channels in the negative direction enclosed within a (-)1 and (-)2 channel. There is one such, a single area (enclosed by its own Overdraw) in the front leg of the horse, which I have left blank in Fig 5 , which will be (-)3. Fig 6. Colour Sequence colour chart for Continuous Line Horse. Mick Burton, Continuous Line Blog. I was inspired by Rainbows in deciding on the sort of Colour Sequences I wanted to use for my Continuous Lines. For shorter sequences, I settled for “partial rainbows” involving two prime colours only with a progression of colour mix and tones from light to dark. For the Elephant I used yellows, greens and blues and for the Horse it was yellows, orange, red and browns in Fig 6. I have carefully selected colours which have a stepped progression, both in colour and tone, and where possible I apply them from the tube (poster colour in the late 1960’s or acrylic now) to achieve an even and solid result. I avoid mixing if I can, to retain the pure consistency of colour application across the painting, but sometimes it is necessary. Fig 7. Black and white photocopy of Colour Chart for Continuous Line Horse. 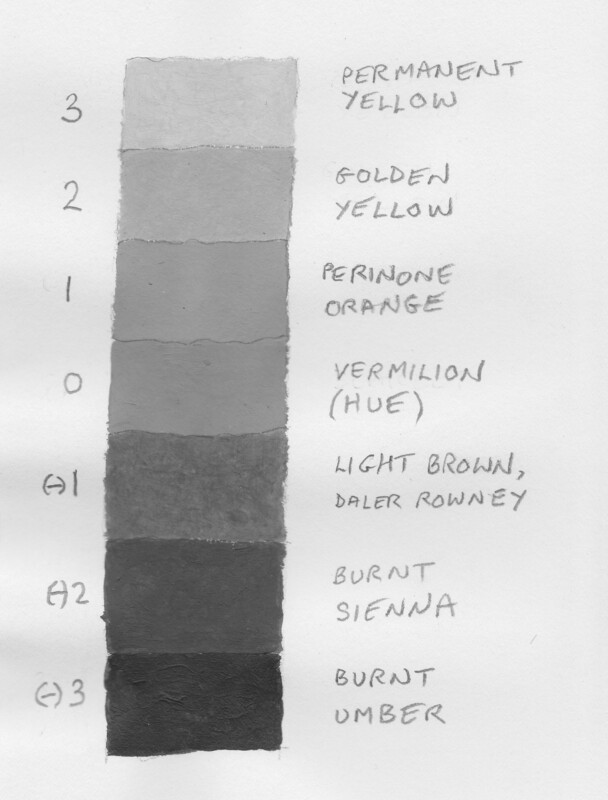 To assess the accuracy of the progression steps of my Colour Sequence chart, I do a black and white (or grayscale) photocopy of my chart to check that the steps still work in monochrome, see Fig 7. Having produced the Colour Sequence chart, we need to decide the direction of the colours matched to the numbers, ie. Light to dark in an upward or a downward direction. Generally I see whether a scale would mostly coincide with where a natural highlight would be, or have more darks towards the lower parts in a drawing to infer shadow. Usually it is fairly obvious, but you can always start again with the other direction of colours. Note that my style may take advantage of natural hints of highlight or shadow on a subject, but generally these aspects (along with perspective) are absent. I remember that when doing equations at school, which produced two answers (+ or (-) ), was a puzzle to me which no one could explain. I understand the concept of a practical outcome from having two answers a bit better now. Fig 8. Initial Colour Sequence pair of colours on Continuous Line Horse. Mick Burton, Continuous Line Blog. Once we have decided on the colour match with the numbers, the initial two colours can be painted in, ie. Vermillion = 0 and Orange = 1, see Fig 8. Fig 9. 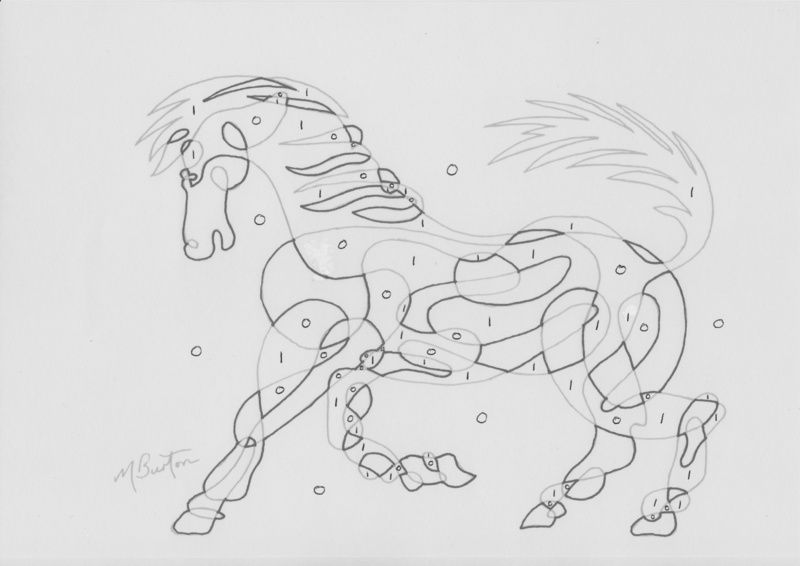 Second Colour Sequence pair of colours on Continuous Line Horse. We can then match numbers 2 and 3 in areas to the colours required in the next channels up, or simply apply Golden Yellow to areas across the overdraw from Orange and then its alternate colour Permanent Yellow, in Fig 9. Fig 10. 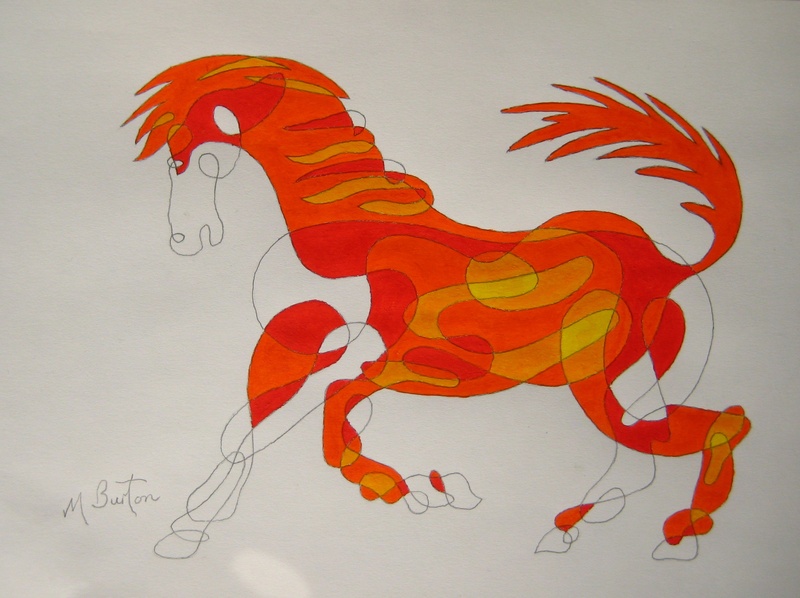 Third Colour Sequence pair of colours, in the negative direction, on the Single Continuous Line Drawing of Horse. Mick Burton, Continuous Line Blog. Now we can match numbers (-)1 and (-)2 in the negative direction, or simply apply Light Brown to areas across the Overdraws from Vermillion. 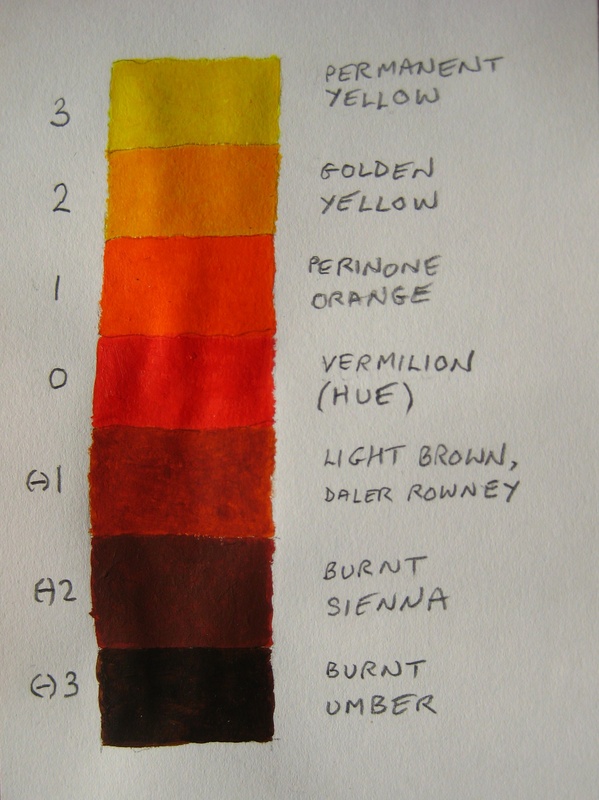 When these Light Brown and Burnt Sienna channels have been completed the last channel colour is (-)3 which is Burnt Umber. In Fig 10 I have left this final area blank (on the front left leg of the Horse). So you have seen my Colour Sequence method, using Alternate Overdraw, for Continuous Line Drawings. Sorry if it has been a long explanation (particularly if you grasped it quickly or had already come across parts of it), but I have tried to pitch it as helpfully as I can, based on my demonstration sessions. A couple a years after I started Colour Sequence I came across the Winding Number Theory. There is a connection and I did pick up one or two ideas from it. I will talk about this in a later post, but as always I am not a trained mathematician and so I will keep talking in pictures. I hope that you will give it a try and I am sure you will enjoy the ride, as I have for so long. If you display or publish your results, it would be great if you could specifically acknowledge me and my ideas. This entry was posted in Animals, My Styles of Drawing and Colouring and tagged Alternate Overdraw, background uncoloured, black and white, black and white tone, closed line, closed overddraw channel, colour sequence, colour sequence chart, colour sequence method, colour sequence numbers, colour sequence pair, coloured horse, colours matched to numbers, Continuous Line, continuous line blog, Continuous line drawing, continuous line horse, direction of colours, elephant continuous line, Horse, Mick Burton continuous line blog, mick burton leeds artist, Mick Burton Yorkshire artist, numbering alternatively, numbering channels, partial rainbow, positive and negative directions, rainbow colour sequence, Winding Number theory on September 27, 2014 by mickburton2. The Sunbathing Foxes are back in Gledhow Valley. Jack Dobson on Show me a real Green Cat.